Qualitative detection of Infectious Bronchitis Virus antigen in avian trachea, kidney or feces sample. Competitive Assay for the qualitative detection of antibody to the most common and prevalent AIV in serum of chickens or ducks. Qualitative detection of avian influenza type A virus antigen in an avian cloaca , Trachea swab or scattered feces. Qualitative detection of avian influenza type A subtype H5 virus antigen (High pathogenic avian influenza virus: HPAI) in avian cloaca, trachea, kidney or feces. Anigen Rapid AIV/H5 AIV Ag Test Kit is a solid phase chromatographic immnunoassay for the qualitative detection of avian influenza type A viruses antigen and avian influenza subtype H5 virus antigen(High pathogenic avian influenza virus:HPAI) in avian cloaca swab, trachea swab, kidney swab or feces. A chromatographic immunoassay for the qualitative detection of avian influenza type A virus antigen and Newcastle disease virus in avian cloaca, trachea or feces. 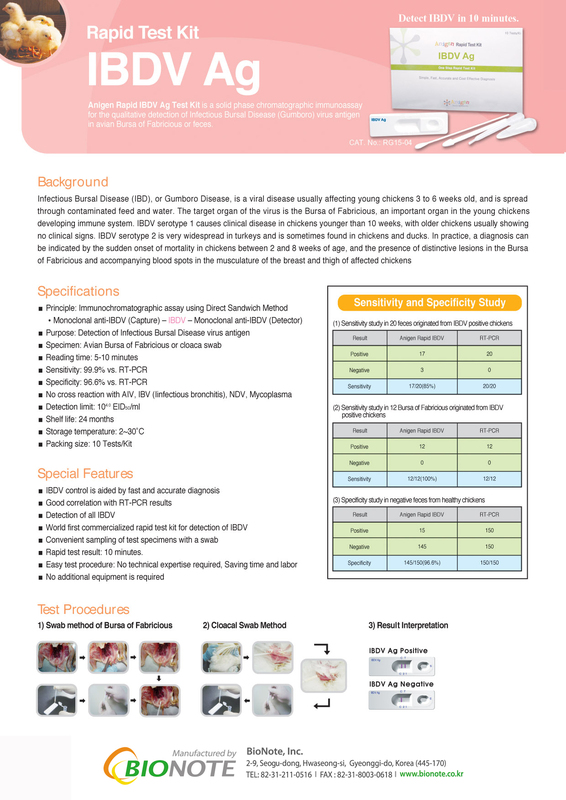 Anigen Rapid Avian Influenza Virus Antigen Test Kit(Bird Flu Detect Test Strip) is a chromatographic immunoassay for the qualitative detection of avian influenza type A virus antigen (H1 ~ H16) in avian cloaca swab and trachea swab specimen. indirect Enzyme Linked Immunosorbent Assay for the qualitative detection of antibodies against Infectious bronchitis virus(IBV) in chicken serum. Competitive Enzyme Linked Immunosorbent Assay(ELISA) for the qualitative detection of antibody to the Avian influenza virus type A (NP) in chicken, turkey, goose or duck serum or egg yolk. Competitive Enzyme Linked Immunosorbent Assay(cELISA) for the qualitative detection of antibody to the avian influenza virus subtype H5 in chicken, turkey, goose or duck serum, plasma or egg yolk. The AniGen NDV Velo Ab ELISA is an indirect Enzyme Linked Immunosorbent Assay for the qualitative detection of velogenic Newcastle disease antibody in chicken serum under 6 weeks old. H5/N1 AIV Real-Time Detection Kit® from BIONOTE, Inc. is useful for detecting the infection of subtype H5/N1 avian influenza.